(1) Types of acute/subacute and chronic headache. (2) The workup of headache. Small vessel smooth muscle cells in cerebral autosomal dominant arteriopathy with subcortical infarcts and leukoencephalopathy (CADASIL). Headaches are common and can be debilitating. Tension headaches are the most common headaches, but migraine and the other more serious headaches often require medical treatment. Several major headache types exist. - Sudden onset of a severe generalized headache, although only 10% of such patients actually have subarachnoid hemorrhage. Additional symptoms include loss of consciousness, vomiting, and neck stiffness. - From a ruptured saccular (berry) or fusiform aneurysm, or sometimes an AVM. - Complications include hemorrhage recurrence/extension, arterial vasospasm, acute/subacute hydrocephalus, and seizures. - By presentation there have been several days of one or more of fever, confusion, vomiting, headache, and neck stiffness. There are signs of meningismus (meningeal irritation) including Brudzinski sign (thigh flexion on neck flexion) and Kernig sign (resistance to passive knee extension with the hip flexed). - Bacteria invade the meninges via either the mucous surfaces of the nasal cavity or the bloodstream. May also be viral, tuberculous, synphilitic, Lyme, fungal, leptomeningeal metastases, Mollaret's, or HaNDL. - May present with one or more of moderate to severe nonspecific headache over the scalp, scalp tenderness, jaw claudication, transient visual disturbance, diplopia (ischemia to cranial nerves), and vision loss. - Presents with one or more of headache, papilledema, pulsatile tinnitus, diplopia (6th nerve palsy), and vision loss (gradually constricting visual fields with late loss of acuity). - MRI may show slit-like ventricles and empty sella turcica. - Unilateral, brief (less than one second up to two minutes) lightning-like pains with abrupt onset and termination that are limited to the distribution of one or more divisions of the trigeminal nerve (International Headache Society, 2004). Triggered by touch, cold wind, talking, or chewing. The pain rarely occurs during sleep. - MRI may show microvascular trigeminal nerve compression. - Rare syndrome that presents with unilateral pain in one or more of the oropharynx, tonsils, base of tongue, or auditory meatus. The pain may be paroxysmal and sharp as in trigeminal neuralgia or it may be continuous and burning/aching in quality. Symptoms are initiated by swallowing or talking. - MRI may show microvascular glossopharyngeal nerve compression. - Following shingles, pain may persist for months to years in the elderly, the immunocompromised, and in those with leukemia or lymphoma. Characterized by a constant, severe, stabbing/burning pain. There may be scars and reduced pinprick sensation in the affected dermatome. - For chronic intermittent headaches, consider the following general scheme. - Lasting seconds --> SUNA/SUNCT. - Lasting minutes --> paroxysmal hemicrania. - Lasting hours --> migraine, cluster headache. - Lasting days --> hemicrania continua. - Frequently bilateral, squeezing, mild to moderate intensity, duration 4-6 hours. - May be episodic or chronic. - Prevalence roughly 20% (Vos, 2012). - There is a prodrome (vague, nonfocal symptoms affecting appetite, mood, or cognition) up to 48 hours before the headache in 10-80% of migraineurs. - There is an aura (focal symptoms, usually a visual aura, sensory phenomena, or aphasia) lasting 5-60 minutes in 20-30% of migraineurs. The most common visual aura is the scintillating scotoma (a field defect circumscribed by shimmering lights) (Kirchmann, 2006). - There is a headache (a unilateral pulsating headache lasting 4-72 hours with nausea or vomiting, photophobia or phonophobia, and worse with activity) (Gilmore and Michael, 2010). - There is a postdrome (tired, "hung over," cognitive difficulties, gastrointestinal upset, mood changes, or weakness) in 68% of migraineurs (Gilmore and Michael, 2010). - Triggered by glare, heat, motion, noise, tyramine foods (cheddar cheese), foods with nitrite preservatives (hot dogs, bacon), chocolate containing phenylethylamine, alcohol, stress, sleep disturbances, and falling estrogen levels. - Prevalence 18% among females and 6% among males (Lipton et al, 2001). - Subtypes include migraine with aura, migraine without aura, chronic migraine, vestibular migraine, basilar migraine, and hemiplegic migraine. - Migraine is associated with numerous syndromes including familial hemiplegic migraine, MELAS, and CADASIL. - Headache present on >15 days per month, use of one or more acute symptomatic headache medications >2 days per week for >3 months, and the headache has developed or worsened during the period of overuse. - Strictly unilateral severe pain, localized in or around the eye, with ipsilateral autonomic features (ptosis, miosis, lacrimation, conjunctival injection, rhinorrhea, and nasal congestion). Triggered by alcohol, eased by movement. - Circadian rhythmicity, up to eight times over 24 hours and occur during the same time (usually at night), duration 15-180 minutes (May, 2005). - In the episodic form (80-90% of patients), headaches occur daily for a cluster of 6-12 weeks, followed by a remission of up to 12 months. - In the chronic form, headaches occur daily without substantial periods of remission. - Prevalence <1%, mostly affects men (Russell, 2004). 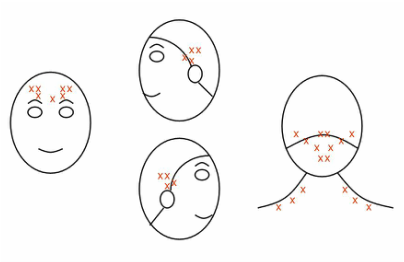 - Continuous unilateral pain with cranial autonomic features (lacrimation, nasal congestion, conjunctival injection, ptosis, facial flushing) and an absolute response to indomethacin (Cittadini and Goadsby, 2010). - Pain in the occiput or orbital regions that may be referred to the ipsilateral arm or shoulder, not to the head. - From injury or degeneration involving the cervical nerve roots, particularly C2. - Acute sinusitis can produce tenderness over the sinuses which is increased by bending forward or coughing or sneezing, but patients who complain of a chronic "sinus" headache rarely have recurrent inflammation of the sinuses and are more likely to have a primary headache syndrome. FBC, electrolytes, Cr, LFTs, blood cultures, CRP, and ESR. Lumbar puncture (cultures, cytology, and xanthrochromia). Temporal artery biopsy (for giant cell arteritis). FBC, electrolytes, Cr, LFTs, and CRP. MRI/V with gadolinium (unless headache is a stable migraine). Consider lumbar puncture (first or worst, progressive, or intractable headache). Consider pituitary screen (IGF-1/GH, T3/T4/TSH, ACTH, LH/FSH/estradiol, prolactin, morning cortisol). - Bed rest with head elevated, mild sedation, analgesics, stop antiplatelets, reduce blood pressure to around 160/100 mmHg. Give salt tablets if hyponatremic. - Following surgical coiling or clipping, give nimodipine 60 mg 4-hourly (reduces delayed ischemia) and an appropriate AED (prevents seizures) during the perioperative period. - Empirical treatment in children includes ceftriaxone 50-100 mg/kg iv 12-hourly or cefotaxime 50 mg/kg iv 6-hourly; either way, add vancomycin 15 mg/kg iv 6-hourly to a maximum of 4 g per day. - Empirical treatment in adults <50 years includes ceftriaxone 2 g iv 12-hourly or cefotaxime 2 g iv 6-hourly; either way, add vancomycin 15 mg/kg iv 6-hourly to a maximum of 4 g per day. - Empirical treatment in adults >50 years includes ceftriaxone 2 g iv 12-hourly or cefotaxime 2 g iv 6-hourly; either way, add vancomycin 15 mg/kg iv 6-hourly to a maximum of 4 g per day plus ampicillin 2 g iv 4-hourly. - Start therapy before biopsy and continue it even if the biopsy is negative. - Commence methylprednisolone 1 g iv daily for three days followed by prednisolone 60-100 mg daily. - Only treat as follows if truly idiopathic. - Give acetazolamide 250 mg bd (up to 1 g bd) to reduce pressure. ​- Consider topiramate 25 mg nocte (up to 100 mg bd) for headache and weight loss. - If there is vision loss or severe papilledema, consider prednisolone 60-100 mg daily for up to one week, no longer. - May need optic nerve sheath fenestration (preserves optic nerve) or lumboperitoneal/ventriculoperitoneal shunting (lowers intracranial pressure). - There are first (Obermann, 2010) and second line medications. - For severe pain in hospital, consider phenytoin 20 mg/kg iv over 30 minutes (for a 70 kg patient this equates to 1400 mg over 30 minutes). If not controlled, additional phenytoin 10 mg/kg iv over 30 minutes. - Consider microvascular decompression in patients with pain refractory to adequate trails of at least three drugs including carbamazepine. The decision should be based on the clinical presentation, not neuroimaging findings (Cheshire, 2005). - Consider botox as well. - Treatment is the same as for trigeminal neuralgia. - For shingles, treat with acyclovir 10mg/kg iv 8-hourly for two weeks plus prednisolone 60 mg daily for two weeks. - For the neuralgia, treat with amitriptyline 10 mg nocte (up to 200 mg nocte), gabapentin 300 mg nocte (up to 900 mg tds), or pregabalin 75 mg nocte (up to 300 mg bd). - Can also try lidocaine-prilocaine 2.5% cream or lidocaine 5% gel or patch. Topical capsaicin 0.075% cream or patch can be helpful. - There are abortive and prophylactic medications. - For abortive therapy, use the same medications as for migraine. - For prophylactic therapy, choose the best prophylactic based on side-effects. - For abortive therapy, give any of paracetamol 1 g at onset then 1 g 6-hourly, aspirin 650 mg at onset then 650 mg 4-hourly, ibuprofen 800-1200 mg at onset then 800 mg 4-hourly, naproxen 500-1000 mg at onset then 250-500 mg after one hour, or indomethacin 50-100 mg bd. - Combination therapy with paracetamol plus an anti-inflammatory plus an antiemetic (metoclopramide, prochlorperazine, domperidone) is useful. - In pregnancy, only use paracetamol or narcotic analgesics. - For more severe migraines, triptans are useful, but are contraindicated in (1) conditions such as ischemic heart disease, stroke, uncontrolled hypertension, or hemiplegic or basilar migraine exist (2) concurrent use of antidepressants including MAOIs and SSRIs and (3) pregnancy (Gilmore and Michael, 2010). ​- For severe migraines in hospital, give metoclopramide 10 mg iv every 8 hours or prochlorperazine 10 mg iv every 8 hours or dexamethasone 10-25 mg as a once-off (Gilmore and Michael, 2010). There is also good evidence for aminophylline 100 mg iv over 20 minutes (Kenyon et al, 2012). - For patients with two or more migraines per week or those in which abortive treatment is ineffective, consider prophylactic therapy. - Avoid topiramate and valproate in women of childbearing age. - If that fails, consider botox. - Stop the overused medication. - Do a steroid bridge either prednisolone 1 mg/kg for five days then decrease by 10 mg per day or dexamethasone 8 mg daily for five days then 4 mg daily for five days. - At the same time, start either amitriptyline 10 mg nocte (increase by 10 mg per day to 50 mg nocte) or propranolol 20 mg bd (increase by 20 mg every second day to 60 mg bd). - Provide triptans for severe migraine, to be used no more than two days per week. 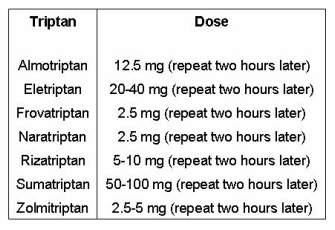 - For abortive therapy, give 100% oxygen 7-12 L for 15-20 minutes or sumatriptan 6 mg sc (repeat once per attack if necessary). - For prophylactic therapy, simultaneously give prednisolone 1 mg/kg daily (for five days then decrease by 10 mg per day) and verapamil 80 mg tds (usual dose 120-160 mg tds, up to 240 mg tds, increase by 80 mg every three days) or sustained-release 240-720 mg daily. Regular ECG monitoring is needed. Side-effects are bradycardia, edema, gastrointestinal discomfort, constipation, and dull headache (May, 2005). Alternatives are valproate 500-2000 mg daily or gabapentin 300-3600 mg daily or topiramate 50-200 mg daily or lithium 600-1500 mg daily (levels must be kept at 0.6-1.2 mmol/L and liver, renal, and TSH must be monitored, side-effects are hyperthyroidism, tremor, and renal dysfunction) or methysergide 1 mg daily (usual dose 4-8 mg, up to 12 mg, short-term side-effects include nausea, muscle cramps, abdominal pain, and edema, long-term side-effects include pulmonary and retroperitoneal fibrosis). - Give indomethacin 50-100 mg bd. Side-effects include gastrointestinal symptoms and dizziness (Cittadini and Goadsby, 2010). - Consider a soft collar for the neck combined with anti-inflammatory medications. - Treat acute sinusitis with vasoconstrictor nose drops such as phenylephrine 0.25% every 2-3 hours, antihistamines such as promethazine 25 mg nocte, and antibiotics such as amoxicillin 500 mg bd for two weeks. If there is a chronic "sinus" headache, diagnose and treat the primary headache syndrome. - Botox therapy can be useful in migraine prophylaxis when all other treatments fail. Botox is indicated when a patient has (1) experienced >15 headache days per month, with >8 days of migraine, over a period of at least six months and (2) had an inadequate response, intolerance, or contraindication to at least three prophylactic migraine medications beforehand. - The total initial dose is 155 units of botox. The needle should be no larger than 30 gauge and the injection angle should be 45 degrees. - The treatment cannot be given more than twice except if the patient achieves and maintains at least a 50% reduction in the number of headache days per month from baseline after two treatment cycles (each of 12 weeks duration). - Botox has been successfully used to treat trigeminal neuralgia; in a study of 42 patients randomly allocated into treatment and placebo groups, 68% of treated compared to 15% of placebo patients had a >50% reduction in mean pain score over twelve weeks (Wu et al, 2012). - The total dose is 75 units of botox. Improving a patient's headache is no trivial thing and can be extremely satisfying for everyone involved, even if one finds headache consults themselves somewhat tedious. Cheshire. 2005. Can MRI distinguish injurious from innocuous trigeminal neurovascular contact? Journal of Neurology, Neurosurgery, and Psychiatry 76, 1470-1471. Cittadini and Goadsby. 2010. Hemicrania continua: a clinical study of 39 patients with diagnostic implications. Brain 133, 1973-1986. Gilmore and Michael. 2010. Treatment of acute migraine headache. American Family Physician 83(3), 271-280.
International Headache Society. 2004. The international classification of headache disorders: 2nd edition. Cephalalgia 24, 9-160. Kenyon et al. 2012. Personal observation: intravenous aminophylline treatment for migraine. Canadian Journal of General Internal Medicine 7(4), 129-134. Kirchmann. 2006. Migraine with aura: new understanding from clinical epidemiologic studies. Current Opinions in Neurology 19, 286-293. Lipton et al. 2001. Migraine diagnosis and treatment: results from the American Migraine Study II. Headache 41, 638-645. May. 2005. Cluster headache: pathogenesis, diagnosis, and management. Lancet 366, 843-855. Obermann. 2010. Treatment options in trigeminal neuralgia. Therapeutic Advances in Neurological Disorders 3(2), 107-115. Russell. 2004. Epidemiology and genetics of cluster headache. Lancet Neurology 3, 279-283. Vos. 2012. Years lived with disability (YLDs) for 1160 sequelae of 289 diseases and injuries 1990-2010: a systematic analysis for the global burden of disease study 2010. Lancet 380 (9859), 2163-2196. Wu et al. 2012. Botulinum toxin type A for the treatment of trigeminal neuralgia: results from a randomized, double-blind, placebo-controlled trial. Cephalalgia 32(6), 443-450.